Improving your business performance is not always easy but with CRM, you can avail an effective business strategy and improve the work performance and productivity. You can stay organized by keep a tracking of all the work flow, all your leads and employees. Being organized helps you not to miss out any opportunity and contact those potential customers and have everything in record. Besides the reporting features to track your work, the CRM Software Systems can serve as the ultimate tool for many areas of your business including sales, marketing and customer service. With CRM software application, you can pull up the entire customer information when the customer calls you for any service. You will be able to give an efficient and quick customer service. You can also automate your marketing campaigns and measure the results through reports. Read more about CRM Software Solutions . In today’s competitive business, companies invest lot of money to generate leads. With many options to bring in more leads like mobile, social media, internet, text messaging etc. So what happens to the inbound leads once you get them? Lead are useless without it being successful conversion. So what are the steps that can be taking to find higher conversion rates. According to the study made on lead conversion, it seems that the possibility of lead conversion increases if the lead is called within 5 mins rather than later. So calling leads immediately could give good response from the lead and avoids the chances of your competitor calling them before you do. Concentrate on contacting the lead and converting them and not count how many leads you have got. More conversations with leads means less time to close the lead to sales. Do not give a chance of missing a lead. Even when you are away from desk or you are on a weekend, make use of cell phone. In this age of mobility, there can be no excuse of missing an incoming lead. Regardless of you being anywhere, make an immediate phone contact with the lead. Not all the leads are converted in the first call itself. So there needs to be a regular followup method in reaching the leads and convincing them for the sale. Many CRM systems provide such capabilities of tracking the re-attempts and providing reminder creation options. CRM systems may help you in a great way to get your leads and give the details to you in minutes. With the stored information, you need to quickly act back and tackle the customer. So the CRM system sounds to be a great benefit only when you make use of it in the right way. Remember that generating leads takes a lot of effort and money. So you need to make use of each lead for conversion. Make use of CRM or lead management systems that will immediately connect you with leads by phone and help you close more sales and maximize your revenue. Free CRM – Is it really worth? Before implementing a free CRM, you should compare the benefits and drawbacks of it with the paid CRM solution to ascertain the best results and to clarify whether the free CRM solution will be able to carry out the customer management needs. Many companies are offering free CRM solutions, with some upfront benefits. Free CRM may be the right one for you if you’re a start-up organization still growing your customer contacts list. Not to forget, that free CRM tools allows you to try before you make a purchase. If the free application can give you what your business needs without any compromises then better grab the one. But if getting it will eat up your resources as they spend time in figuring it on how to use it, then better to go for a paid one which would offer user friendly and efficient features. Note that when you plan to upgrade your system to a different one can be a painful experience. Migrating the complete data is a real headache. So if you are expecting to grow anytime soon, then keep this in mind. Also, if you do select a free system, can it be upgraded for a fee? That would solve your worries of upgrading by paying as you grow. Also will you get enough support for free tools if any queries or issues? Many free CRM tools have their limitations like amount of data that you upload or no of files you upload, no of contacts you can add etc. There are chances that you are entering duplicate customer data instead of realizing that the customer information already exists. You may be restricted in running necessary searches or getting reports. When it comes to paid CRM, these options are all included. In some cases, you can go for 15-30 day free trials or opt for paying nominal fees to start and use it for few days before purchasing the entire CRM application. This helps in understanding the CRM before considering it for your business. On the whole, free CRM tools are worth for start-up organizations only. Free CRM solutions are not a perfect solution because as you grow you’ll find out that you need a robust solution. Instead you can choose a paid CRM solution with the least available package and further upgrade it when required. If you run a small business, you need a simple and easy to use CRM system. Small businesses are constrained by a lack of resource and time. The last thing you need is to manage a complicated CRM system that doesn’t suit your business. A CRM system that actually supports and enhances the way you do business will save you a significant amount of time and money. Product like Maple CRM have all the essential features that a small and medium businesses need from a CRM system. The Cloud model is particularly suitable for organizations with multiple locations or sales people who work remotely or at home. Maple CRM is aimed at organizations which needs a straightforward CRM sales, marketing and support system. 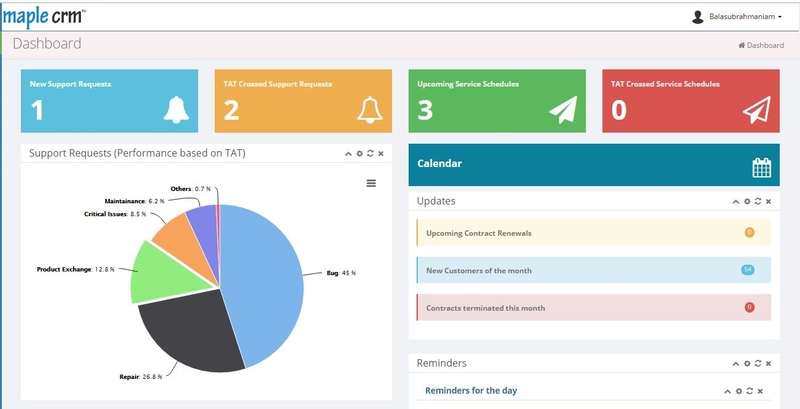 Simple Cloud based CRM is well suited to small businesses because they don’t require hardware and software installations, is easy to set up and use and since it is hosted by the provider, you don’t need to worry about the IT support including downtime servicing and upgrades. Web based CRM systems are also easily scalable. You can upgrade the number of users almost instantly as your business grows. Web based integration with your existing website or legacy CRM systems. 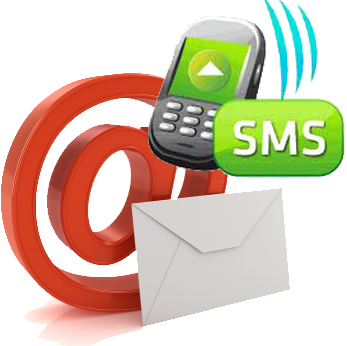 EMail and SMS Campaigns for Marketing & Sales. Custom Reports and Charts for analysis and reporting. Fully configurable to suit your type of business. We also provide 24×7 online support. Customers can contact us through phone, email or chat. Maple is a CRM software product which manages the complete life cycle of a customer. With maple, you don’t have to worry about both time and customer management. Maple enables you to create and sustain relationship with your customer with an easy to use tool thus helping you to get business success. CRM software is not a big company application. It is a necessity for every business when it comes to managing sales activities and customer service. Let’s say your business is slow and you need a pickup, if you are utilizing a CRM Software, you can look into your database and see who are the most likely prospects to buy again. Say you were offering products and one of the lead liked it but the price was little out of her range. Given that it was good business time that you were having and you had no reason to drop the price but you had noted it down in your CRM software and forgot about it. Now when you actually need business and you are okay to reduce the price, you go to your database and search for such possible leads and find this prospect and appropriate notes that were added. You contact this lead and make the offer and you may get the deal. You can also send promotional emails for such interested leads and get the deal using a CRM software. That is just one example of how valuable a CRM Software system can be for your small business. Your database and your customer list are the most important things to your business. Stay in touch with customers periodically and they will remember you and recommend you. Definitely, small businesses need CRM Software as much as the big enterprises! Benefits of small business CRM is not limited to just improving customer service levels, but also to quickly automate key business functions like Sales, Marketing and Customer Support. Implementing CRM for small business enables effective collaboration across all departments and business channels in real-time. Having a CRM software system for business allows companies to improve employee productivity, shorten sales cycles and increase revenue, while cutting sales and marketing related expenses. Do remember that CRM is no longer an option to build your business, it is a necessity for your business strategy. It has become as important as the mobile phone that you carry along with you. Maple CRM is one such software which was developed not only to serve the purpose of CRM strategy but also to give an ease of use and a useful interface to work on for small and medium businesses. Whether you want it for your sales team or for providing customer support, the software can ease your work with its flexible and customizable options. The software has been able to serve various types if industries in India and includes functionalities which can be used for day to day business activities. A CRM software systems isn’t just a good to have sort of but it can do wonders for your business and help improve the productivity of your business. CRM system can be used to manage the entire sales process. This could include scheduling appointments, storing contact details, activities and to-dos, recording all interactions with customers as well as generating accurate reports to understand the result of the process. CRM System is the one whole source for you to manage your entire business. Starting with Sales aspects, the system can help you generate leads into customers, then it can classify these leads into different categories so that you can spend time on the ones who are possibly going to be customers. Analyse the sales report and see how is the business going and how are the sales team working. Then ensure that your customers are getting good service and all the information can be easily stored in the system so that whenever required everything is available instantly. This does save a whole lot of time of your service executives. Then try getting more customers with various marketing campaigns. CRM will give an idea on whom to target and it will keep a record of everything. Where to find a good CRM System? 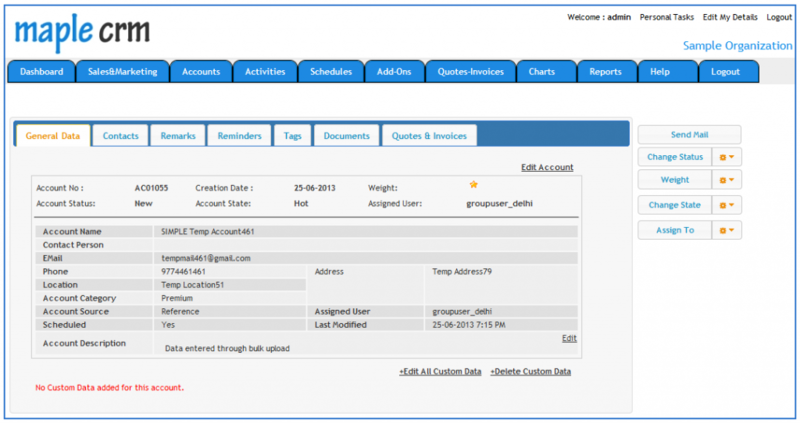 Maple CRM is a customizable easy to use CRM with useful features for your business. You can manage Sales, Marketing and Customer service in an efficient way using Maple CRM. All in all a simple integrated software that suit any type of business and can help in business functions.